do ordain and establish this constitution for the State of Alaska." These simple words were written by Alaskans and for Alaskans as the introduction to the Constitution of the State of Alaska, the treasured document that gives citizens the reasons and intent of the law under which they are governed. Alaska's Constitution is uncomplicated, written in plain English that anyone can read. It is a short document, designed to leave the greater authority to the state's legislators, elected by us, among us and for us. with signatures of the attendees. Gaining Statehood wasn't easy for Alaska. The federal government required of Alaska's political body lengthy and complete preparation, dedication, and perseverance toward its goal. Alaskans would need to prove to Congress that Alaska had the courage to take on the responsibilities of Statehood, that it had the resource wealth to support itself, that it would not become a financial drain on the federal government, and, perhaps most of all, that it could govern itself wisely and well. That was a charge that a delegation of Alaska's leaders, the delegation charged with drafting a Constitution were ready to address. Alaskans shrewdly decided to draft their Constitution well before Statehood was granted. The decision was, in fact, part of the political maneuvering to convince Congress that forward-thinking Alaskans were ready, willing and able to manage their own affairs. The miracle of the Constitutional Convention was that a collection of 55 ordinary Alaskans, men and women from every walk of life, living in the remote reaches of the continent not even contiguous to the 48 states farther south, would draft such a simple, beautiful, carefully crafted and fully functional document. And they did it in 90 days! The drafting of Alaska's Constitution was not a dramatic event. The fifty-five delegates were chosen from Alaska's cities, towns and villages to take part in the historic undertaking. They were men and woman from every walk of life. The number 55 was chosen to match the 55 delegates to the drafting of the U.S. Constitution in Philadelphia back in 1798. Each community elected its own delegate(s). In Ketchikan, W.O. "Bo" Smith was chosen to represent his city at the Constitutional Convention. Bo Smith was one of four Smith brothers, Bo, Ben, Jim and Bob, who were the sons of a Magistrate at Craig. The brothers all fished and Bob had a fish-buying scow. Bo campaigned via personal contact and letters to the editor. As a fisherman, he said his primary interest and experience was in fisheries, a prime consideration in Ketchikan. He was elected and then named chair of the committee on resources when he arrived in Fairbanks for the Convention. In addition, he was appointed a member of the committee on direct legislation, amendment and revision. Records indicate that most of the delegates were enthusiastic proponents of Statehood and they shared a political idealism that had sustained the Statehood movement. They also shared a sense of historical purpose. To see their names, faces and hometowns, click on this link. There were no Brooks Brothers suits or spike heels on display 50 years ago as the delegates trudged across the University of Alaska Fairbanks campus to Constitution Hall on a frigid, dark morning of Nov.8, 1955. They wore parkas or heavy coats and snow boots. 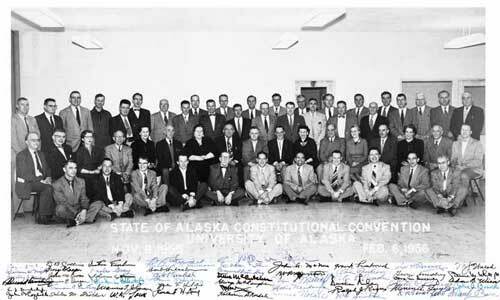 The delegates, chaired by Bill Egan of Valdez, would be able to finish their duties by Feb. 6, 1956. Territorial Alaska in 1956 was not the State of Alaska of today. Only two of the main streets in Anchorage, Alaska's largest city, were paved! The city of tiny fuel-efficient homes and Quonset huts was on its way to become a polished metropolis. Fairbanks had a couple of paved streets but the city, second largest, was clouded with dust in the summer and ice fog in the winters. Ketchikan, Alaska's southernmost city, looked much as it had in when it was founded in 1900. The capital city Juneau, much older than those larger cities, and smaller, snuggled up against the looming mountains of Alaska's spectacular Inside Passage. The Constitution was as accomplished fact by February 1956 and was approved by the voters two months later. But there were still a number of political hurdles to jump in the future, the not the least of which was convincing a hesitant U.S. Congress to approve Statehood for a Territory that was, still, considered Seward's Folly or "Walrussia" in some stodgy back-east minds. Finally a reluctant Congress approved Statehood by a squeakily narrow margin. And still time and events marched on. Then, almost unexpectedly three long years after the Alaska Constitution was in place. In the wee hours of Saturday morning, January 3, 1959, Alaskans were startled awake to clanging church bells and wailing sirens. The urgent can't-wait clamor echoed through the blackness of an Alaska winter night to announce that back in Washington D.C. President Dwight D. Eisenhower had just signed the long-awaited law that made Alaska the "49th State." Statehood for Alaska had at last become a reality! Alaskans had worked long and hard to shed their largely neglected Territorial status. It was time to celebrate the fact that their great land of resource wealth and opportunity would now become a contributing member of the Union of States under the Stars and Stripes, a flag now 49 stars! Alaska was the first new state since Arizona joined the Union in 1912, almost half a century earlier. Fairbanks was frozen stiff in 30-below weather and ice fog when the exciting news came in. The building in which Alaska's Constitution had been written three-plus years earlier sat silent within a glittery haze of ice crystals. It was at least 30 degrees below zero on campus and it was even colder in the valley below where Fairbanks was uniformly muffled in a thick white blanket of ice fog. Alaska's second largest city boasted 13,000 souls who were temporarily distracted by making sure furnaces and automobiles kept operating. In an excited Anchorage to the south, not quite so cold, plans were underway for a wide variety of Statehood celebrations including Statehood themes for the city's Fur Rendezvous to be held soon. Anchorage had become Alaska's largest city after World War II and by 1959 boasted a population of almost 83,000! In the capital city of Juneau, population almost 10,000, the news was received with high excitement. Every American school child in the (now) 49 States would learn that Juneau was the State Capital! The seated Governor in 1959, Mike Stepovich of Fairbanks, would be the last of the Territorial governors appointed by the President. From now on, Alaska's Governor would be elected by a vote of the people of Alaska! To the south in Ketchikan, population about 6,500 (which was the third largest Alaska city until Juneau annexed Douglas) the reaction to the Statehood news was mixed. Independent fishermen, however, rejoiced! Ketchikan's economy had, since early in the century, been dependant largely on the fishery industry, specifically its many fish canneries. Ketchikan at that time billed itself "The Salmon Capital of the World." There was at one time a sign on the docks that read "We Catch What We Can and Can What We Catch." The posts holding up the "Welcome to Ketchikan" sign on Mission Street were circled with can labels from the region's processors. The canneries kept the rainy city economically afloat. The full significance of the news began to sink in that frigid day in 1959 when Statehood became a fact. Alaskans would now be able to vote(!) to elect a governor. They would at last be able to vote for the President of the United States who, until Statehood, had appointed Alaska governors. They would be able to elect two Senators and a Congressman to represent them in Washington D.C. They would now be in charge of their own vast natural resources and manage their fish and game. And, predictably, one of their very first acts would abolish the salmon fish traps! Alaska's Constitution is a model document admired by other, older states. Alaskans can be proud of it. It was the dedication, wisdom and teamwork of the 55 men and women from every part of Alaska who drafted that document that has become a model among the 50 states. And it is those dedicated Alaskans and their accomplishments that we honor this year, 2005, the 50th anniversary of their historic service to their state.